Guide on how to board the subway from confirming the entrance to getting into the train. 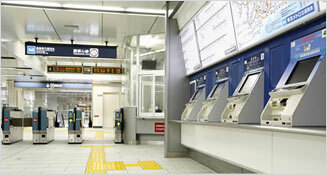 Tokyo Metro and Toei Subway operate the subways in Tokyo. 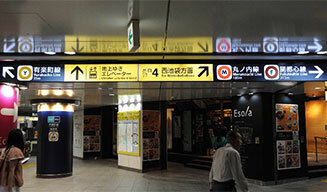 At the entrance to each station, you will see the subway sign and the name of the subway station. Be sure to remember the station name, number and line color (circular colored outline) of the subway line you want to ride. You will see the combination of a letter (representing the line) and a number (representing the station) within a circular colored outline (representing the color of the line), which is called a station number. For more information on station numbers, click on the link below. When you get to the station, confirm the way to the subway line with the overhead sign. 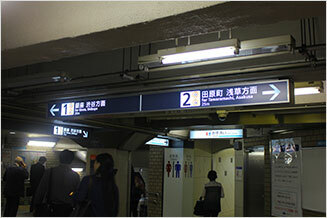 You will see line symbol and the name of the subway line that could help guide you to the fare gate. Be sure to follow the arrow to go to the appropriate subway line. First, search for the fare to your destination. You can search for it using the English fare chart located close to the ticket vending machines. You can also search for your fare using a fare search system or a smartphone app. After finding your fare, buy your ticket at the ticket vending machine. If you do not understand Japanese, you can change the ticket vending machine screen to English by pressing the “English” button on the top-right corner of the screen. Touch the "Ticket" button and touch on your fare amount. Then insert coins and/or bills into the ticket vending machine to purchase your ticket. *Remember to collect your change. Note:Credit cards cannot be used except for when purchasing passes. You can buy tickets to your destination without finding the fare by using one of the ticket vending machine’s convenient features. 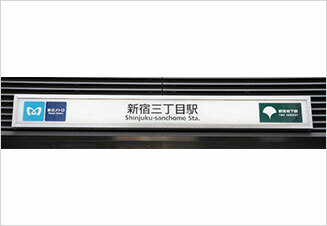 You can also buy transfer tickets onto JR and other railway lines. 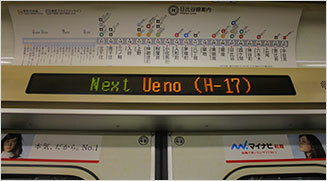 Enter the station of destination using alphabet characters. Touch the desired station of destination and insert coins or bills to purchase your ticket. Select the line, tap on the desired station of destination and insert coins or bills to purchase your ticket. Note:Credit cards cannot be used except for when buying passes. Other than Regular Tickets, PASMO and convenient tickets such as 1-Day Open Tickets can be purchased. 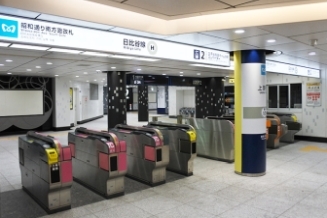 IC cards such as PASMO and Suica can be charged using ticket vending machines. Insert your ticket into the slot located above the green arrow on the fare gate. Please do not forget to take your ticket as you pass through. If you are using a PASMO card, hold the card over the card reader on the gate, which is indicated by a blue light and has the "IC" logo on the panel. You will hear a beep sound the moment your card is read. Find your platform by looking for your train line and its direction on the sign. 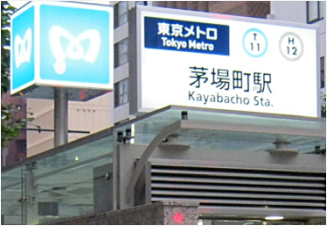 The sign shows the direction with numbers and station names along with main stops of each direction. Be sure to wait for the train at the appropriate platform by confirm the number of the platform. Line up behind the white line on the platform at the guides which indicate where the doors will open when the train arrives. Wait for the alighting passengers to get off before boarding the train. Please do not rush when trying to catch the train. For further information regarding things to consider when riding the subway, please click on the link below. 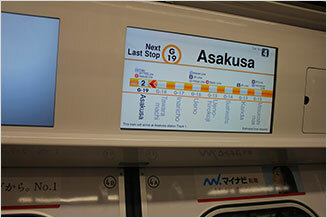 You can check the station you are currently at or which station you are heading to, and how long there is left until your destination on the information displays above the train doors. For more information about what to do after getting off the train, please click on the link below.